These might be my favorite costumes to date! 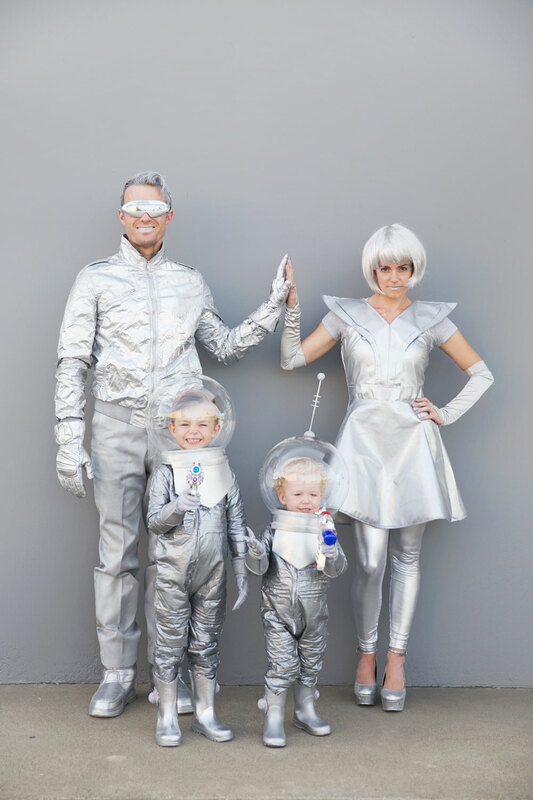 I mean there was a LOT of spray paint involved, but it was worth it, all fumes aside ;) These costumes take a little time to make but if your kids are into space it’s a real winner. 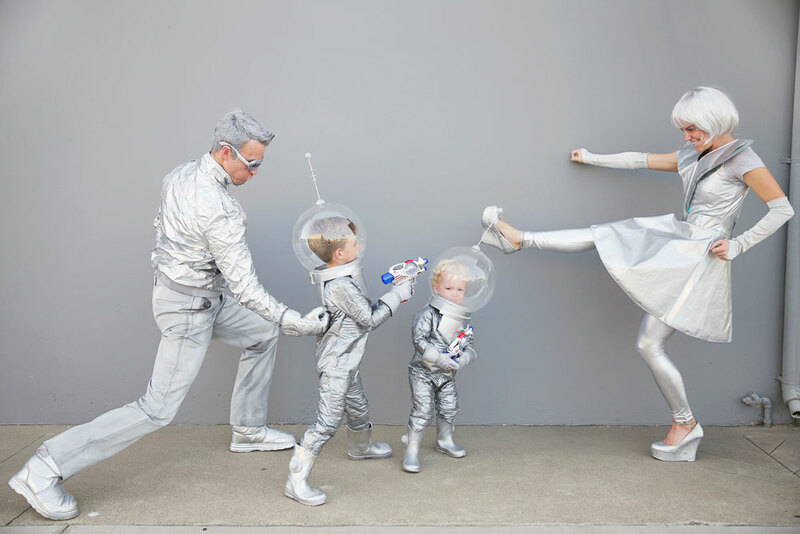 Read on to get the tutorial for these DIY space family costumes. 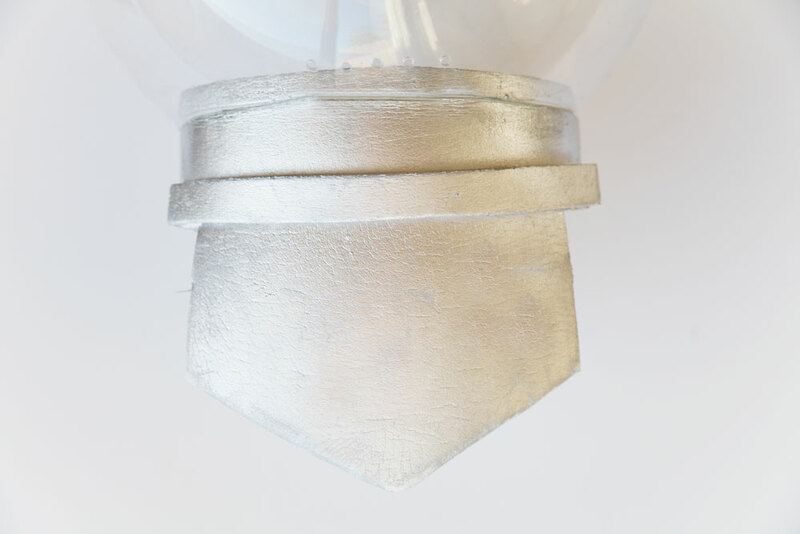 You will need lots and lots of Metallic silver spray paint. We used a total of 4 cans. –Glasses are from Amazon. We spray painted them silver. 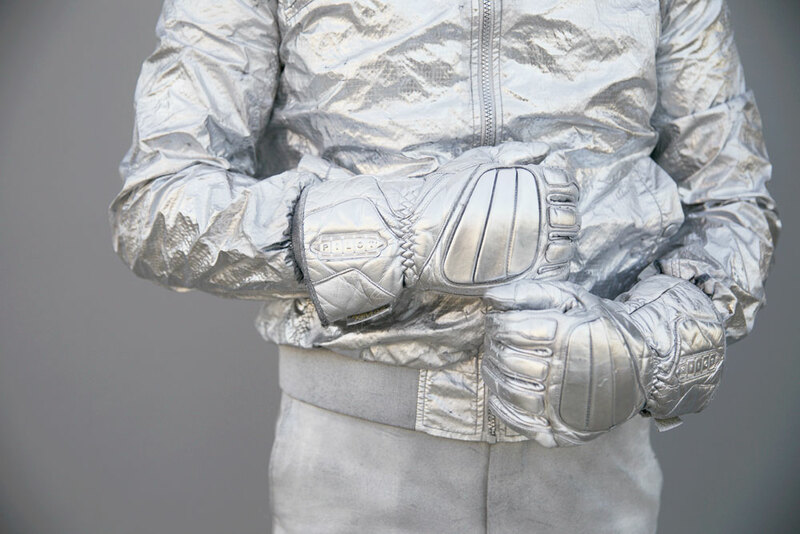 –Jacket, pants and boots were all thrifted and gloves are his old leather motorcycle gloves, but all were spray painted silver as well. A tip for this is try to get fabrics that will spray paint well and that look awesome even before you start to spray them. -We sprayed his hair with a silver hair spray. -My dress and shoes were thrifted. 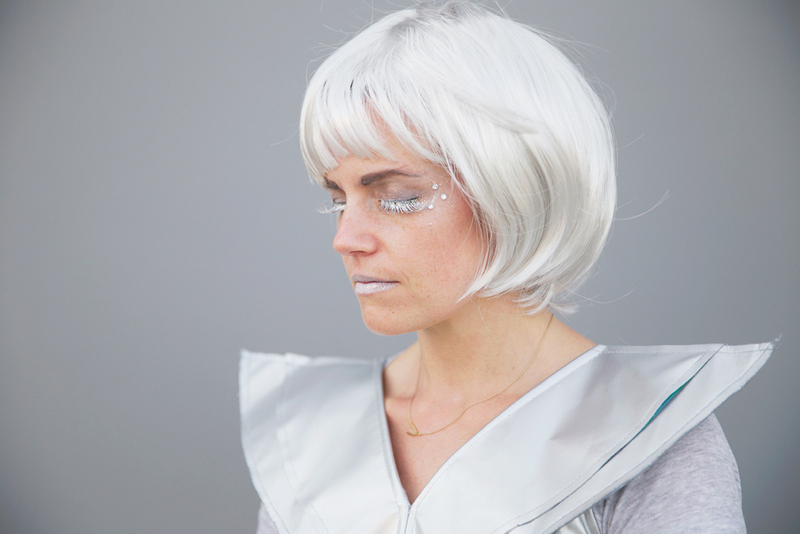 The dress was already a futuristic costume dress but was more iridescent blue. So I spray painted it to match the others. But here is one online, and here and here and THIS ONE IS AMAZING! FIY some fabrics take a LOT more spray paint that others it all depends. Shoes I got for $8 at a thrift store and spray painted them silver. Or HERE are some fun ones! –Leggings are from American Apparel and are pretty fabulous! –Face Makeup from a local Halloween store. This is where things get a little more in depth. –Shoes were thrifted, spray painted and I put some foam balls, cut in half, on each shoe. –Gloves are Power Ranger gloves. I spray painted the cuff, and painted the actual gloves with metallic fabric paint. –Their outfits are made from duct tape. 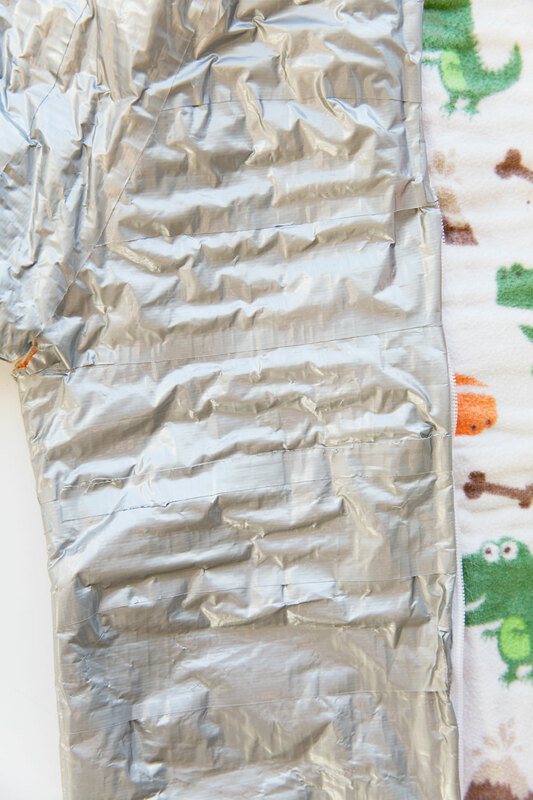 I grabbed some old PJ onesies and covered them in duct tape. One strip at a time, piece upon piece. I put pieces of yarn underneath certain areas to give it a cool texture. The zipper is still exposed so that they can unzip them and hop in and out. *TIP!!! The duct tape makes the outfits pretty HOT. If you are in a cold area then great! 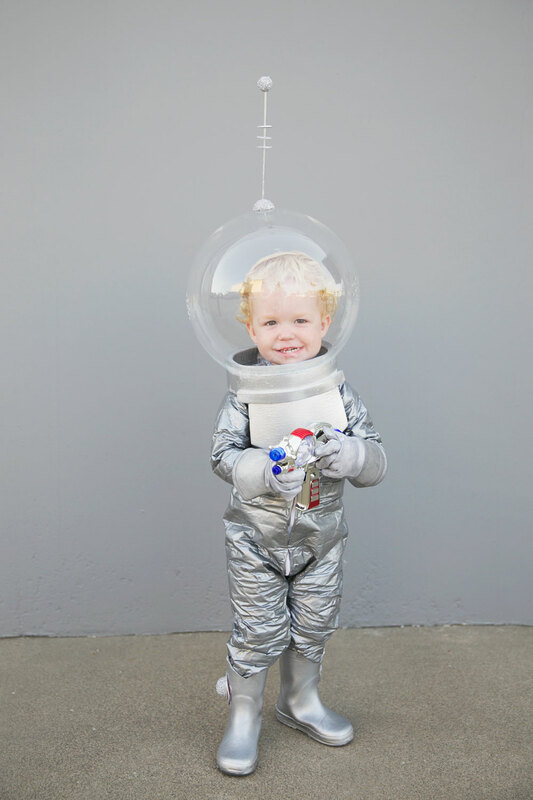 But, if you live somewhere pretty warm (like us) you are going to want to make the costume a little more breathable. Make sure to size UP when you use or buy a onsie. The duct tape makes them much smaller and stiffer. Also I sliced air slits in the arms and legs so the air would circulate better. –The Helmet. I found a bunch of tutorials online of people that have done the same thing, here is my favorite one, which we followed pretty closely. We bought 12 in acrylic plastic globes, I didn’t want the globes to be too huge on their heads (they are crazy light!). Cut the bottom big enough so that if fits over their head. It was about an 1 inch to 1 1/4 inch more. You are going to want to sand it because it will be very rough and dangerous. Then we drilled air hole all over it. They do not fit tight onto their heads and there is plenty of air that comes up through the bottom, BUT the more air the better right ha ha? For the bottom piece of the helmet we used a thick foam. Cut a rim to go around the bottom and then a breast and back piece to help hold it in place (similar to the tutorial). We used spray glue and duct tape to secure it and stick all the pieces together. Then spray painted the whole bottom (while it was UNattached to the helmet.) 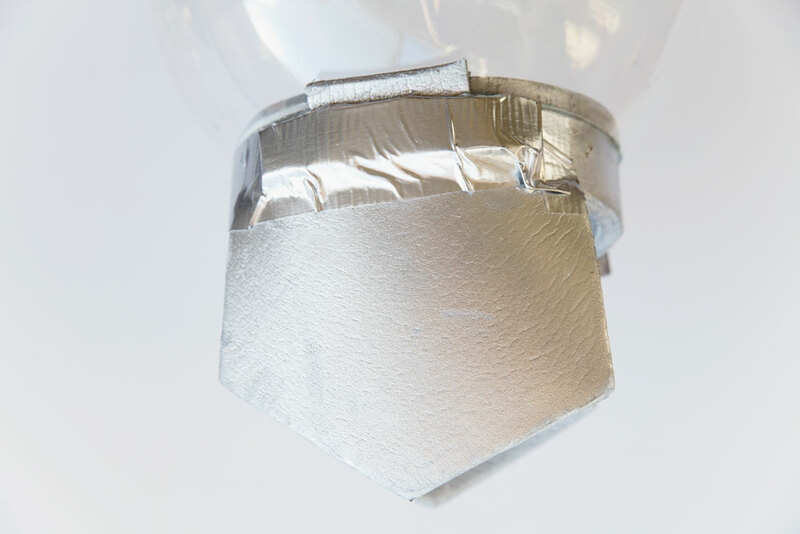 –Antenna is made from a wood skewer, foam balls and a foam sheet. 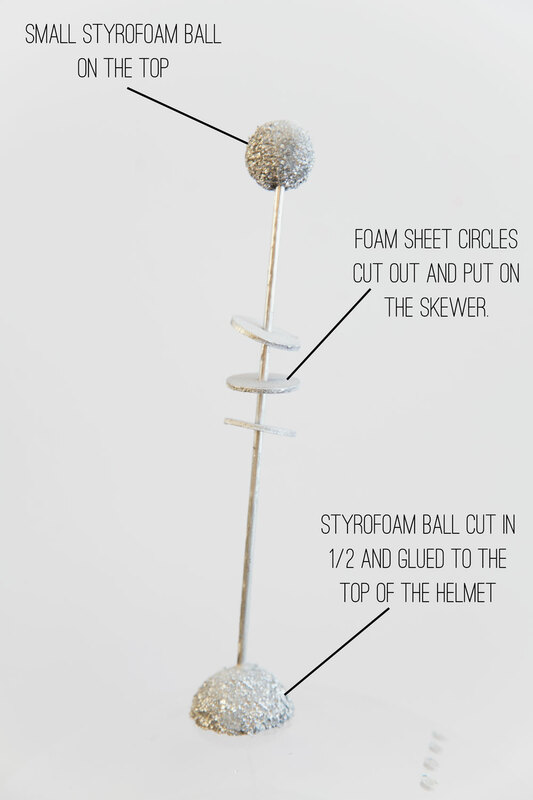 I sliced a bigger foam ball in half as the base that is on the helmet, then the skewer with three small circles from a foam sheet and topped with a smaller foam ball. 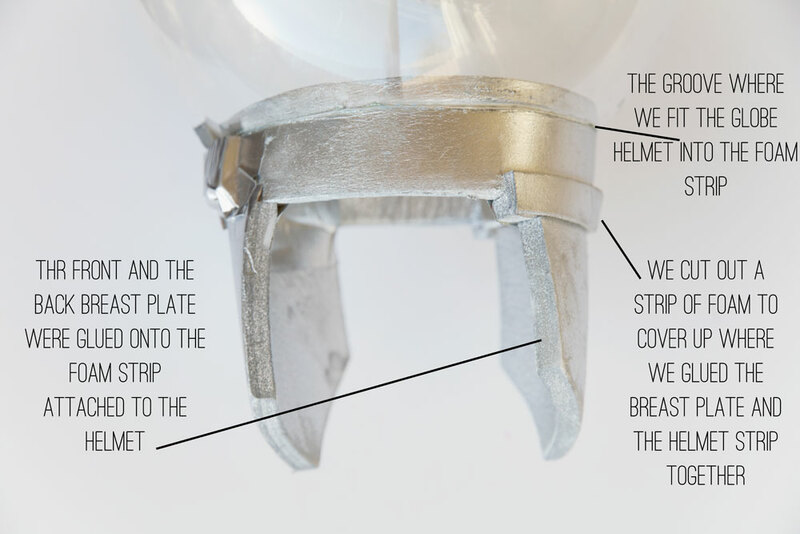 The spray paint and glue to the top of the helmet. 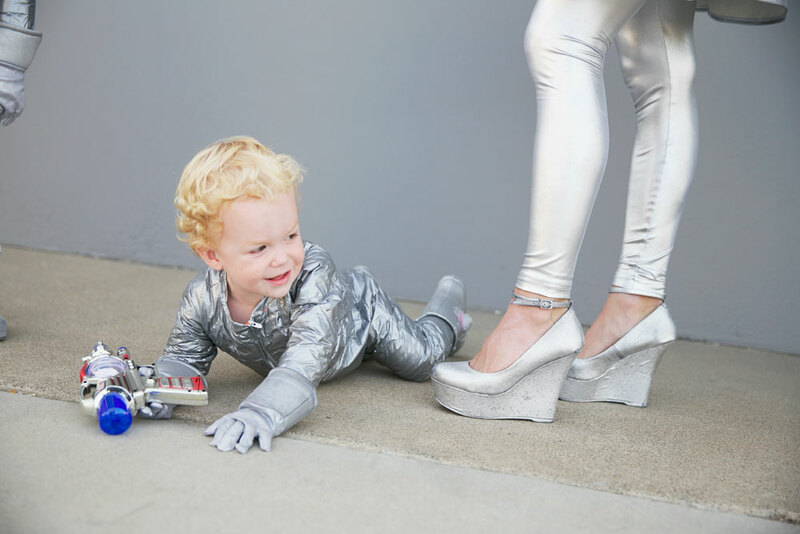 –Space Guns (my kids’ very favorite part) are from amazon. ** WARNING: We were told from the globe manufacturer that these are ACRYLIC plastic, not just plastic, so they can break if hit hard enough! IF you have little kids, like I do, make sure they aren’t running around where they could fall onto the helmet. They are plastic so bumps will be fine, but better safe than sorry. We made ours easy to take on and off. 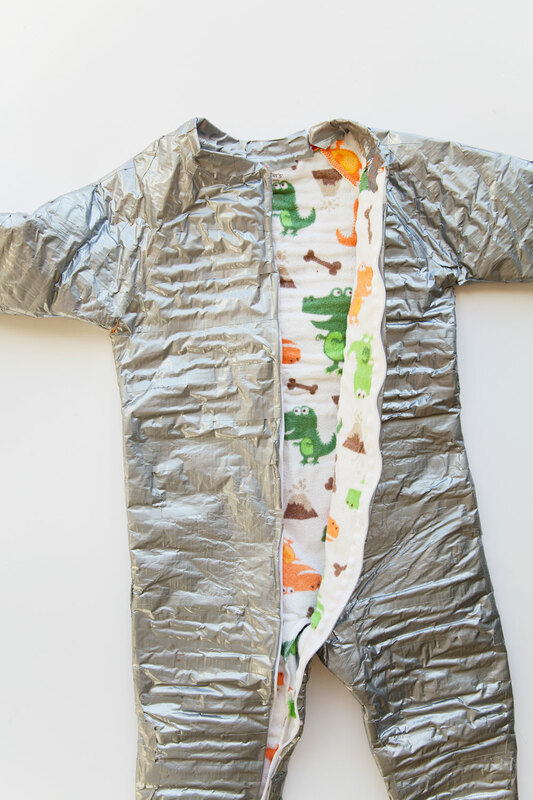 The duct tape onesie idea I got from Parenthood magazine. And the helmet tutorial I got from here. These costumes are amazing! You did a fabulous job! 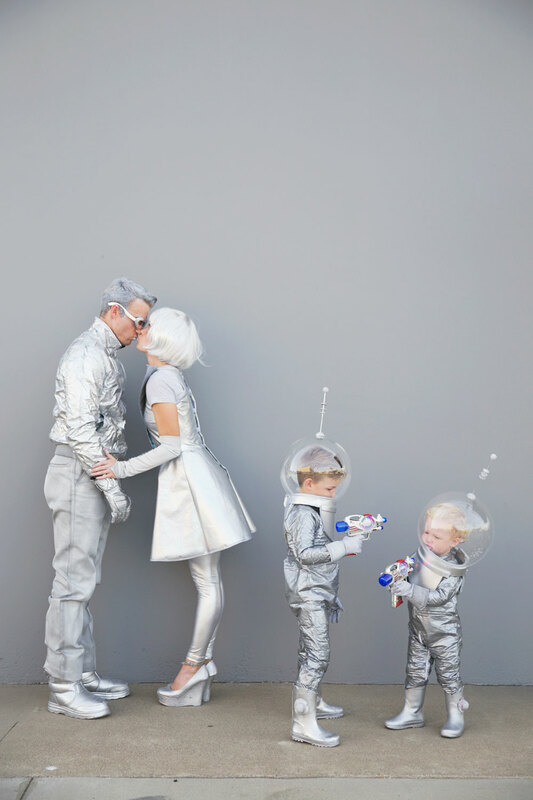 So many favorite details from this costume…… but tops are your eyelashes, the boys fishbowl head pieces and your husbands sunglasses. So creative! AMAZING!!!! 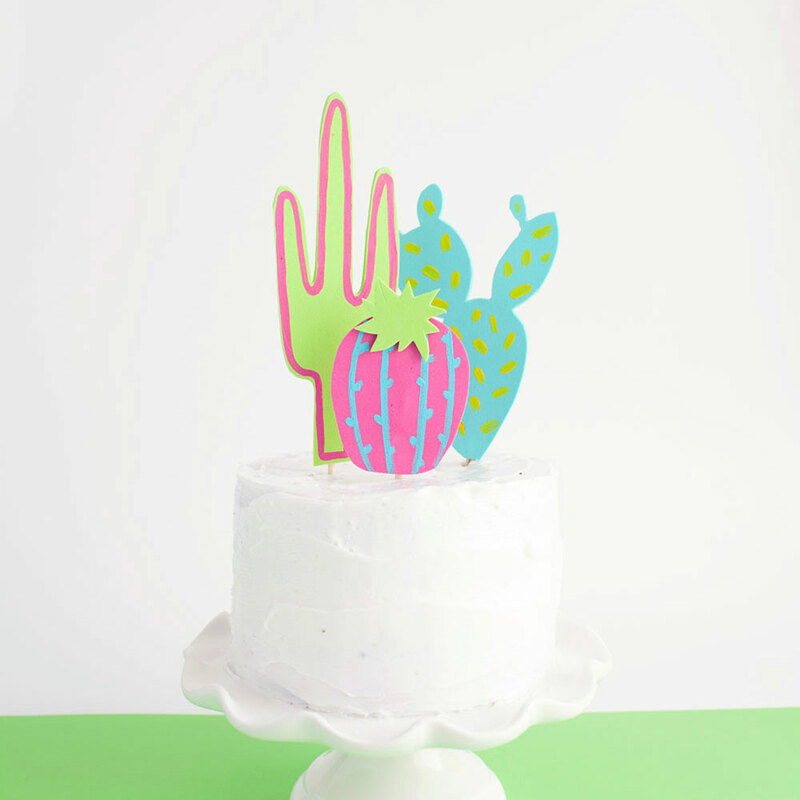 These are so, so, so good, Sara! First, let me just say that you are AMAZING! So incredibly creative!!! 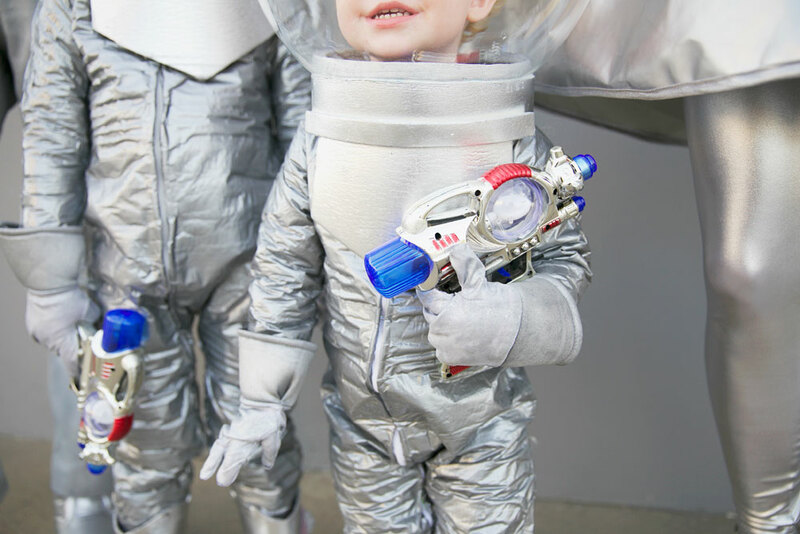 I’m trying to make the spaceboy costume for my daughter. I have the acrylic globe but I don’t know what to use to cut the opening. I’ve already drilled some holes (a ton actually and its still hard for me to breathe in there)! Just trying to figure out if I’m just going to have to cut a big panel out of the front so the poor girl can breathe! Thanks for your help… I know this is an old post. This costume is amazing!! for the adult clothing did you have to prime the clothing before you spray painted them? Hi! For my costume I didn’t and it was fine. For my husbands gloves and boots they needed something more because the paint wouldn’t set well. All the other clothes took the spray paint fine. A primer might help or a top coat of something to keep the paint on well. But everything else worked great. It kind of depends on the material of each item :) Hope that helped? 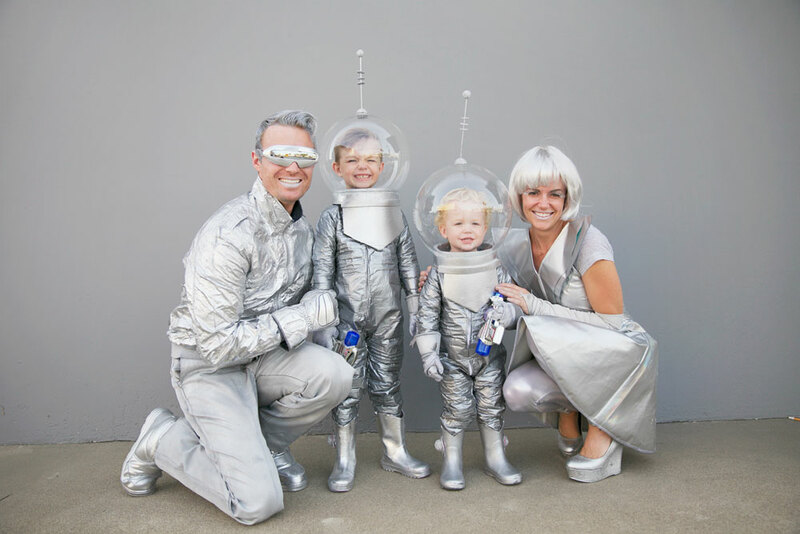 Love the costumes btw… we are doing these this halloween… only I’ll be 9 months pregnant! 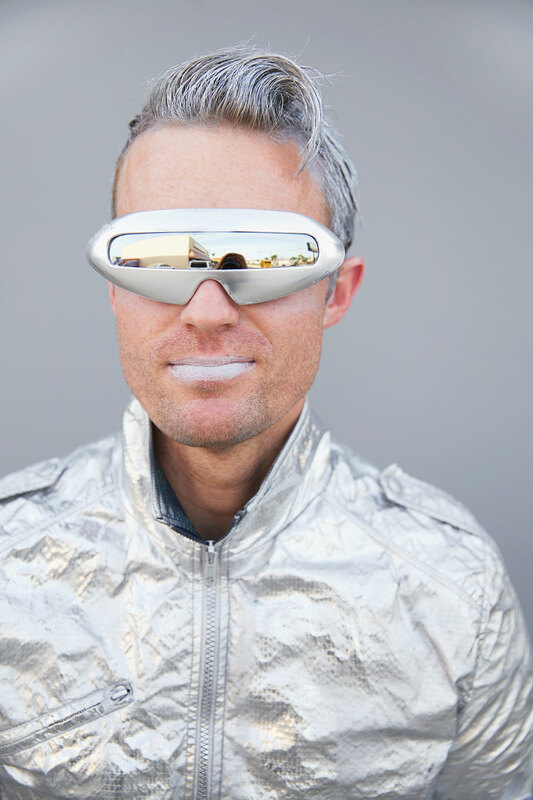 Questions- about how much to spend making the space helmets? I can’t find a 12” acrylic bowl for less then $25. 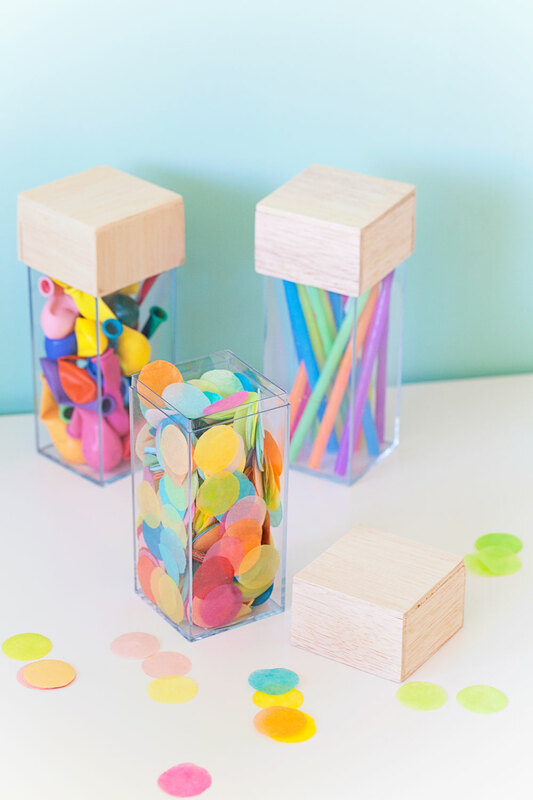 My two boys are 4 and 2 and just wondering if the 12” acrylic bowl would work for both of them? Or if you got on size larger then the other? Also any chance you would ever be in the business of making/selling some of your crafty costume ideas you’ve made?! Silly and dumb question i’m sure but I had to ask. I would pay for these- but can’t find anything similar online? Hi Jenna! 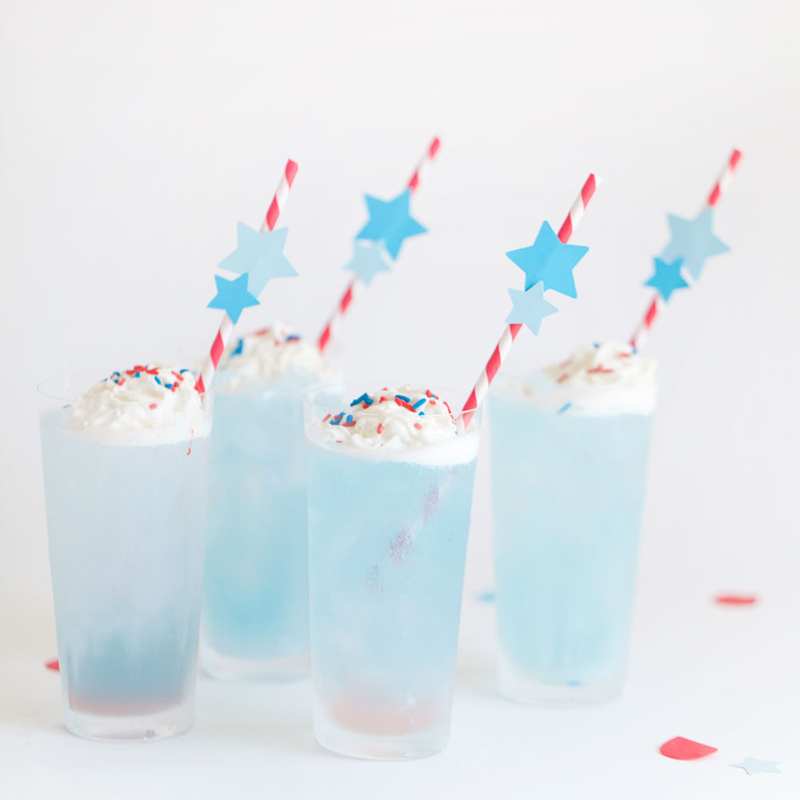 Oh I am soooo excited you are making these! The 12″ ones worked great for both my boys. My oldest was 4 at the time and my youngest 2 as well! You will need to cut an opening though. The other larger size acrylic globes will have bigger openings but they will be huge on their heads. Unfortunately the only ones I found were the ones I linked to on my site from ebay. The foam we got from an upholstery (for car and furniture) warehouse. You should call around and see if any near you have any scraps. You don’t need a ton of foam but it needs to be thick and sturdy to hold the globes on. They were just scraps so they cost less than $10. All together both helmets and foam were $65. ha ha its not a dumb question! People actually email me all the time about buying my costumes. I should have kept those helmets but they were hard to store so we ended up just giving them away. Most of our costumes we have either given away or trashed :( its so sad when you work so hard on them but I SHOULD start selling them ha ha. hope this helped?? let me know if you have any other questions! Good luck! This is so AMAZING! 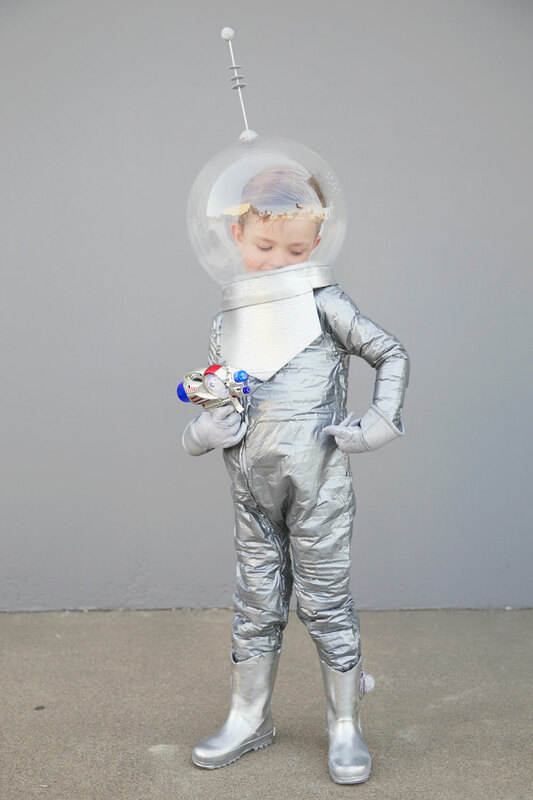 I’m working on an astronaut costume for my little girl and I’m doing the same as you did with duck taping a one piece pj, just using white tape instead. I’m pretty sure you ran the tape horizontally, but I wanted to ask??? I ran it vertically (with towels stuffed inside) and when I went to put it on her…it had pulled to tightly in the zipper area that it didn’t fit her =0( So i’m starting over and found your version, which is fantastic! Thanks for sharing! Hi!! Going to be making a globe style helmet for myself! Wondering if I could get your opinion if you think a 16” globe would be big enough for an adult! TIA these costumes are super creative! 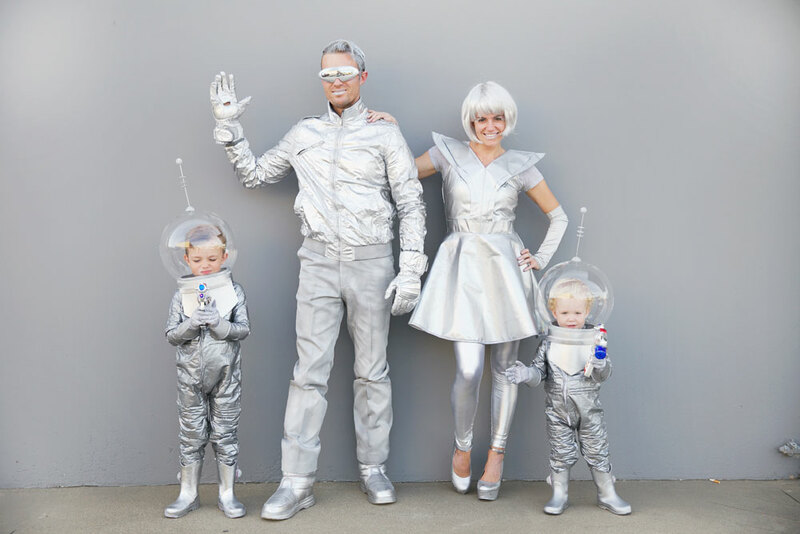 Our family is going with a space theme, but all as different characters (husband will carry baby in front carrier so he will be dressed as outer space and rocket ship, baby is astronaut, one son is another astronaut, second son is a green alien, and I’m going as the futuristic space women). So mostly I’m looking for a costume just for me. I’ve never spray painted clothes and wondering the process and the outcome is. Are they stiff? Did you hang them or lay flat to spray them? Your dress is exactly what I was looking for. 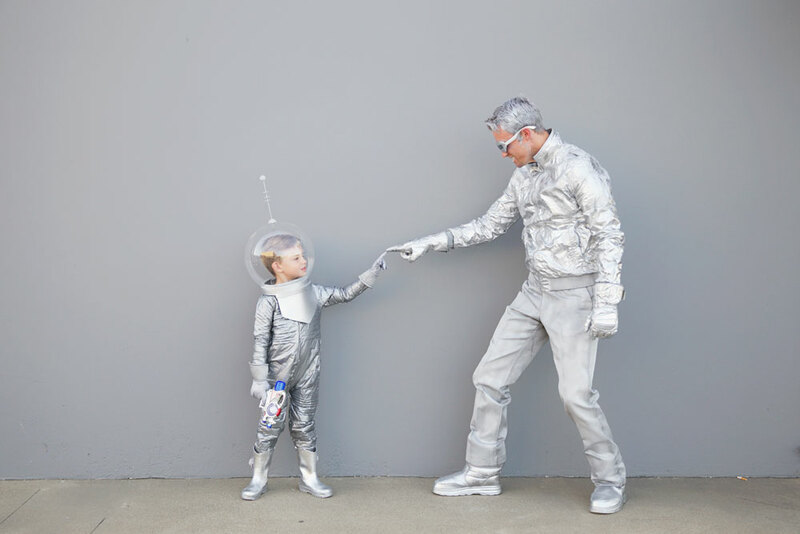 It’s so hard to buy costumes for a family friendly party that aren’t to revealing. Oh my gosh how fun I am excited! Hmmmm for the baby….it might be cute just to give them a little antenna on a headband? Or even a grey baby pilots helmet (made of cloth) like these here…https://www.etsy.com/listing/211543453/baby-pilot-hat-hearing-aid-hat-gray-mesh?ga_order=most_relevant&ga_search_type=all&ga_view_type=gallery&ga_search_query=baby%20pilots%20cap&ref=sr_gallery-1-3&organic_search_click=1 I used the silver metallic spray paint on EVERYTHING ha ha. You can also find all the spray paint at home depot. Depending on the fabric type some turn out more vibrant and metallic and some or more muted and need a lot more spray paint. It all depends! I tried to get fabrics that were more smooth like windbreakers and things. Good luck!! 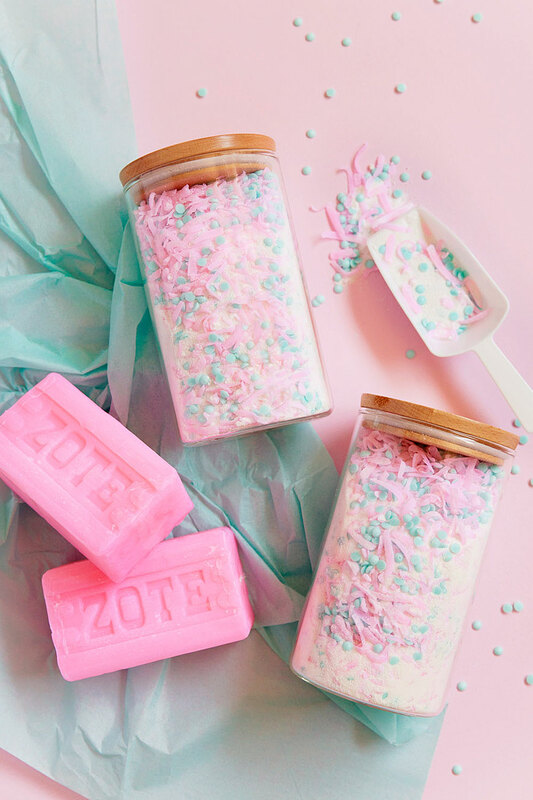 I would love to see how they turn out! So so sweet of you for answering so quickly !!! You probably will hear from me again throughout the process! I only need those costume for february so I got some time hahah. Thx for the idea for the baby love it !!! What did you use to cut the globe opening bigger ? Hi what did you use to cut open the opening on the globe? Not sure what and how to cut it open? Did you use same thing for holes and for the main opening to make it larger? Hi Chaya! We used a Dremel rotary saw with a small cutting disk. I would reccomend buying a few extra cutting disks? They are pretty thin and snapped easily. We put tape down first so it didn’t crack the plastic. Here is a link to some….